If you are going to go by the looks before you settle down for the right laptop, then the Toshiba Satellite U925T may not be your choice. However, other features may make it more attractive, and that includes the price and the brand image it has. What some may not like is the rotate and slide mechanism on the laptop’s back. It is certainly does nothing to enhance the aesthetic value you may want in your laptop. But the positive side to this satellite series from Toshiba is the ruggedness and reliability. However distracting the hinge in the back may be, the fact is, it does its job flawlessly. 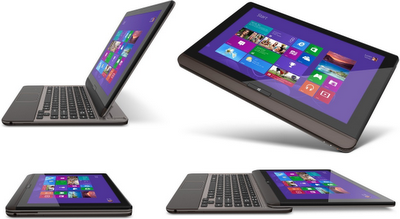 You can even lay the screen opened flat to the keyboard, making it useful in certain situations. So if you are thinking in terms of having a laptop that you can keep it flat to the wall or on a plain vertical support, this satellite is just the right one for you. But you should discover your own reason why you may want to put a laptop straight against the wall or place it standing upright. There isn’t much to recommend the Toshiba Satellite U925T for those to who looks matter much. The color is very similar, double-tone grey or brown that you encounter in many other Toshiba Satellites. With grey metallic surface and smooth touch, you may find the laptop a bit too slippery. There is however a big advantage that laptops are expected to have; at 3.2 pounds and with features it has, it is one of the lightest to sell in the market. That makes carrying around easier. It will fit neatly into a small carry case, neatly and tidily. What makes it so much like a Tablets is not only the lay flat feature, but the thickness as well, which hardly measures 0.8 inches, even when closed. As for other laptop requirements, the features are just the minimum – 2 USB ports, 1 SD card slot, a headphone jack and a HDMI port. You could only wish they had an Ethernet port, it could possibly have given buyers a reason to choose it. A welcome addition, for which its needs applause, is the NFC chip that is located near the place you will use for resting your palm. For the present, you may not find any use for this chip, but may be, you can use it for transferring files to another NFC chip based device. The other things that you can expect in the Toshiba Satellite U925T is Windows 8 preloaded, multi-touch control, power saving eco-friendly feature, a computer health check monitor, sleep charging ports that you can use for powering your Smartphone or MP3 player, even though you may have chosen to switch off your satellite. The other standard features, you cannot really call them exclusive, are, Intel Wireless Display that can be linked to a HDTV to give you great sound and picture quality, and finally the backlit keyboard which will make working in twilight conditions much easier. That should really prove to be great asset when travelling.